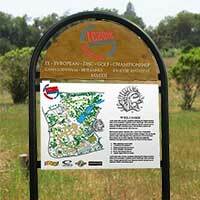 First impressions count, so good quality, well positioned signage is crucial to the success of a Disc Golf course. We can design and produce signage from a range of styles and materials that are best suited to your course and have the most positive impact on players and the environment. 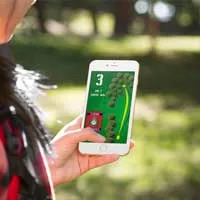 In addition to the signs installed on the course, Disc Zoo can produce electronic versions of your maps for download and viewing on smartphones as a ‘Caddy Book’ during the round. 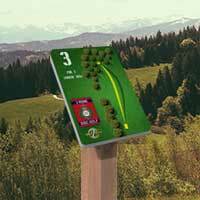 We can produce scorecards with integrated maps, waterproof bonded laminate maps, accessible maps for the visually impaired and anything else you need to help players find their way around your course! Individual maps of a hole can show more detail than is possible on an overall course map. These are particularly useful on holes where you want to give the player notes about the hole layout. For example, if there are complex Out of Bounds restrictions that need to be conveyed to the players, or if there’s a particularly useful position for a spotter to stand. Having a good map is essential for every course. Players on their first time round any course need to be able to navigate from hole to hole with ease. This not only makes it safe as players are throwing along the correct fairways in the right direction, it also makes their first game more enjoyable and is therefore more likely to get them out there for another round! Combining the course map with the hole maps makes for a great ‘Map Pack’. This can be produced in a range of digital formats for download to phones, tablets or emailing, or they can be printed as a ‘Caddy Book’ to give a hole-by-hole walkthrough of the course. Integrating directional signs into the basket not only looks great but will point players in the direction of the next tee. 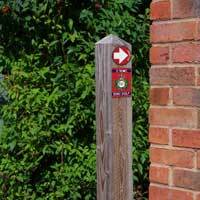 Sometimes there may be a short walk between holes so waymarkers placed in stategic locations can guide players in the right direction and prevents them from getting lost.